June 29, 2017 | 11:23 a.m. The refugee resettlement process in the United States is wracked by uncertainty. Given the Trump administration's attempt to block immigrants from several majority-Muslim nations and place a hiatus on refugees entering the U.S., along with ongoing court disputes over this policy's intent and legality, the number of people resettling in Wisconsin has dropped so far in 2017. Despite President Donald Trump's rhetoric about a need for "extreme vetting," would-be refugees from any country hoping to resettle in the U.S. are examined in multiple layers of vetting by the United Nations and federal agencies before they even board a plane. After Trump issued his initial executive order on January 27, 2017 that laid out the so-called travel ban, non-profit agencies that receive federal funding to help resettle refugees, including those in Wisconsin, began to worry about having to shut down or lay off staff as refugee arrivals decreased. The U.S. refugee program, managed by the State Department, provides per-capita funding to agencies for each refugee resettled, so fewer refugees coming in means less funding overall. On May 4, a bipartisan group of U.S. senators sent a letter to the Department of Homeland Security asking why the agency appeared, for a time, to have stopped the work it does as part of the vetting process for refugees. To make things more confusing for resettlement agencies, the Trump administration cut its target for fiscal-year 2017's refugee admissions by half, then quietly reversed that decision in late May. Inevitably, refugee arrivals in Wisconsin and across the entire U.S. slowed significantly over the first half of the year. Between January 1 and June 25, Wisconsin resettled 439 refugees, out of a total of 23,185 across the U.S. Over the same period in 2016, 762 refugees had resettled in Wisconsin, and 34,278 in the nation as a whole. As has been the case for many years, the vast majority of refugees moving to Wisconsin are resettled in Milwaukee. Barring a massive policy shift from the Trump administration, or a Supreme Court ruling decisively striking down the ban before the end of the year, it is highly unlikely that the U.S. or Wisconsin will resettle anywhere near as many refugees in 2017 as in recent years. The question of what constitutes a "bona fide relationship" for refugees immediately created more confusion for resettlement agencies. Does someone have to have a family member already settled in the U.S. to qualify, or might some other connection qualify them for the exception, such as an offer of employment? Refugee resettlement organizations scrambled to try and figure out an answer. "It's really vague and I've seen several emails going back and forth today that nobody knows what it means," said Dawn Berney, executive director of Jewish Social Services of Madison, on June 26. "It doesn't specifically say that it has to be family, but it doesn't specifically define what that connection must be." A spokesperson for the United Nations High Commissioner for Refugees, said Tuesday, June 27 it was that it was awaiting more specific guidance from the U.S. State Department, which oversees resettlement in the U.S. In a press briefing that same day, State Department spokesperson Heather Nauert said the administration was working out how to interpret the ruling. "Bona fide relationship — we don’t have a definition here at the State Department for that yet," she said. "None of the agencies has that definition just yet. That we will be working to get; that I anticipate will take a couple days to get that. However, I can tell you in terms of refugees who are already slated to be coming here, we have been in touch with them. By that I mean we have advised our refugee resettlement partners overseas that they should currently proceed with the resettlement of refugees who are scheduled to travel to the United States through July the 6th." Another Wisconsin organization that resettles refugees, World Relief Fox Valley, knows that about 30 percent of the people it works with already have family ties in the United States, says office director Tami McLaughlin. The group is trying to figure out if the "entities" language in the Supreme Court's ruling provides an opening for refugees without family ties here. "We are not sure if the relationship with us that's established before the refugees come might allow us to continue to resettle certain refugees," McLaughlin said. On Thursday, June 29, NPR reported that the State Department would interpret "bona fide relationship" to mean certain close family ties, job offers, or invitations to lecture to lecture at a U.S. university. The Trump administration said it planned to begin enforcing its executive order again on Thursday at 8 p.m. Eastern Time. The refugee resettlement process is driven by international crisis and upheaval, so it's inherently unpredictable to begin with. Resettlement agencies make decisions about where people should go based on a variety of factors:where the best resources are, where potential jobs are, and where a refugee might find family members or communities of people from their original home countries. A general increase in refugees to the United States won't always mean a new influx in a given place, and Wisconsin is a fairly minor refugee destinations compared to other, larger states. The upheaval in refugee admissions since January has played out differently for resettlement agencies in Wisconsin, but they all face ongoing uncertainty. State-level refugee agencies are all satellites of national organizations known as voluntary agencies, or VOLAGs, that interact more directly with the federal government and do much of the work of deciding where new refugee arrivals will settle. World Relief Fox Valley had to lay off two of its thirteen staffers when its parent organization, World Relief, announced plans to scale back and close five offices elsewhere in the U.S.. World Relief Fox Valley's McLaughlin said the group has since dealt with unpredictable ups and downs in the numbers of refugees its parent organization says it can expect. McLaughlin added that World Relief is also waiting on answers to "a lot of unanswered questions from the government in terms of what does this mean, what does this look like, what should we think." Like all such voluntary agency affiliates, World Relief Fox Valley receives per-capita federal funding for each refugee it resettles, in addition to other forms of funding, both federal and private. These non-profits do a variety of other work in addition to refugee resettlement, so the overall funding picture will differ from one organization to another. For World Relief Fox Valley, though, that per-capita federal funding covers about one-third of its overall budget, McLaughlin said. While conspiracy theorists, anti-immigration ideologues and other detractors have characterized the U.S. refugee resettlement program as a lucrative government-funded scheme for non-profits, the executive order highlighted how much voluntary agencies depend on per-capita funding, and how quickly their operations can become precarious. "The amount is really nowhere near enough to cover the cost of the labor that's involved in helping people resettle," said Rebecca Schwartz, resettlement coordinator for Jewish Social Services of Madison. For instance, the organization finds donated furniture for new arrivals to make its funding for refugees' other needs go farther. Jewish Social Services had an active refugee program in the 1990s and early 2000s, mostly working with Jewish people fleeing Eastern Europe and Russia, but hadn't done resettlement work for many years. But last year, the organization decided to start back up again. It had already started resettling refugees, and was in the process of trying to hire more staff for coordinating its work when the executive order was issued. "To get started in a situation like this has been quite unpredictable," Schwartz said. Initially, Jewish Social Services planned to resettle 50 individuals in fiscal year 2017, working with HIAS, its parent national organization. "Pretty much as soon as the executive order hit, we were contacted and told it looks like it's pretty much going to be cut in half," she noted. Jewish Social Services hasn't had to lay anyone off because it's still rebuilding its refugee program. But the fluctuating expectations make it hard for the organization to promise anyone full-time or even stable employment. Like her counterparts at World Relief Fox Valley, Schwartz was told to expect fewer refugees in 2017, and then to perhaps expect more. She's worried that if Jewish Social Services resettles too many people around the same time, all in the Madison area, the city's current shortage of affordable housing could put them in a bind. "Really the biggest challenge in Madison is housing," Schwartz said. "If we get a rush toward the end of the year, we could have a real housing crisis on our hands." The uncertainty state-level refugee agencies face reflects their national parent organizations' struggle to get on the same page with the Trump administration. "We do get information from time to time from the State Department, but we're really not getting much from Homeland Security," said Melanie Nezer, a spokesperson with HIAS. "It just seems like a lot of the systems that have been in place for communication with the resettlement agencies … have kind of broken down. I don't know if that's specific to resettlement or if it's just the way the government is working right now in the early phases of this administration." Asked if federal agencies had at any point slowed or stopped the work they're supposed to be doing as part of the resettlement process, Nezer said, "Honestly, we really don't know." One recourse the VOLAGs have is to try and seek support through Congress, where refugee resettlement has tended to be a bipartisan issue, as divisive as it may seem in national politics right now. The executive branch does get to set annual goals for how many refugees the U.S. admits, but it still depends on Congress to fund those programs. Nezer said HIAS is trying to communicate as much as it can with legislators, and wants to continue to have a productive partnership with the administration. She believes it was harder to stir up opposition to refugee resettlement during the 1970s, '80s and '90s, when many of the refugees coming to the United States were departing countries under Soviet control or influence, or, like Wisconsin's Hmong community, fleeing the aftermath of the Vietnam War. "Now the program is much more diverse and people are coming from many many countries in turmoil all over the world and there's much less understanding of what people are fleeing and what the conditions are," Nezer said. Wisconsin offers a good example of this perception gap. While Hmong and Somali refugee communities seem to be the most prominent groups of refugees in the state, Wisconsin has welcomed refugees from dozens of countries. 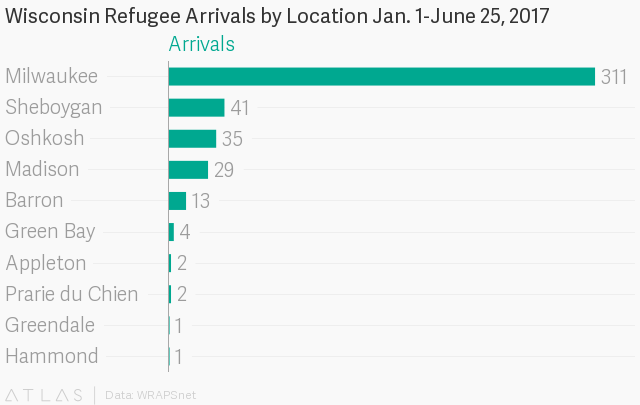 One thing that hasn't changed so far in 2017 is that Burma is the leading country of origin for refugees settling in Wisconsin. 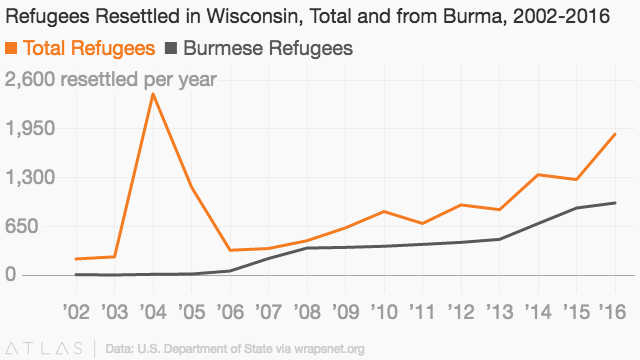 Of the 439 refugees that had come to Wisconsin as of June 25, 246 were from Burma. Buma's government has long been engaged in civil wars and campaigns of persecution against several ethnic and religious minority groups. Nezer also said that while the executive order has motivated a lot of public support for refugee resettlement, it's also revealed broad misconceptions about how large refugee admissions are relative to all immigration to the United States and how the vetting process works. "We need to do a better job, I think. Resources are so stretched, but I think if everybody met a refugee in person, that would change a lot of people's minds about this program," she said. World Relief Fox Valley's McLaughlin said she hopes that the structure of the refugee process in the United States — depending on government agencies and their funding, but with a network of private non-profits doing a lot of the on-the-ground work of resettlement — will prove resilient even in turbulent times. She noted that the U.S. refugee resettlement program was designed as a public-private partnership, and that current unsettled policy is an example of why that was done. "Governments change, administrations change," she said. "Our mission has not."